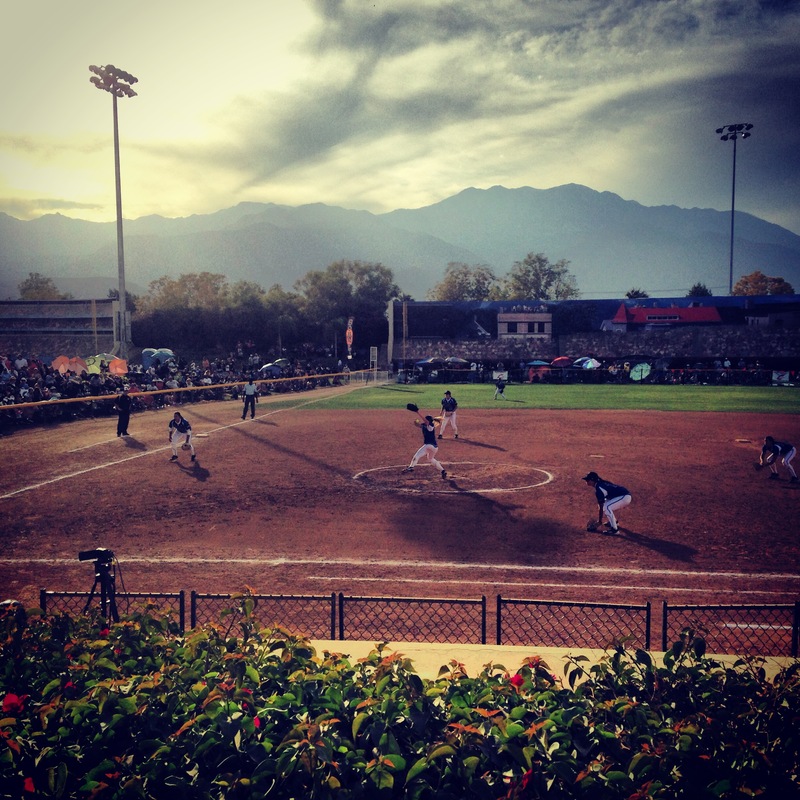 Went to Palm Springs for the Mary Nutter Softball Classic at the Big League Dreams Park. 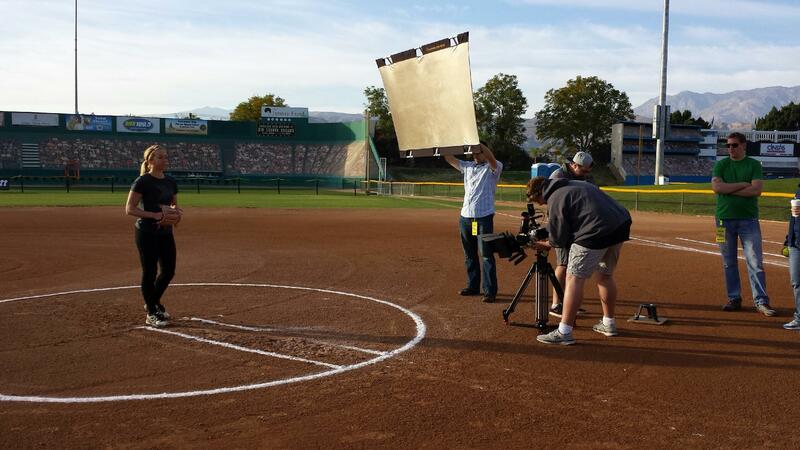 What an amazing weekend of watching high level softball, getting to listen in on interviews from many of the top teams’ coaches and players, and then an awesome video shoot with a camera called the Phantom that shoots at 3200 frames per second. (In comparison, this video was shot at 1000 frames per second). By the way — the views you will see in these pictures are stunning. AWESOME weather with sunny skies and beautiful backdrops! The teams that were there at the tournament included Tennessee, Washington, Oregon, Arizona, Nebraska, Texas, Stanford, Texas A&M, Baylor, Oklahoma State, Cal St Fullerton, UCLA, Cal, LSU, Pacific, Cal State Northridge, Oregon State, UNLV, Missouri, amongst others! To see all of the results of the many, many great match ups from this weekend, click here. What I learned: I love this game more than anything, this weekend was definitely a reinforcement for that. But what I also learned, is that the talent at the D1 level is spread out amongst all conferences. In the past, there were just a few schools who would “take the cake” year in and year out. What’s so fun about going out to a game now, is that you really don’t know who is going to win simply by looking at the names on the uniforms. 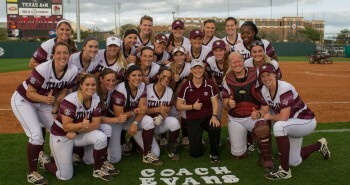 Who I enjoyed watching: I really enjoyed being able to see Ellen Renfroe pitch in real life. 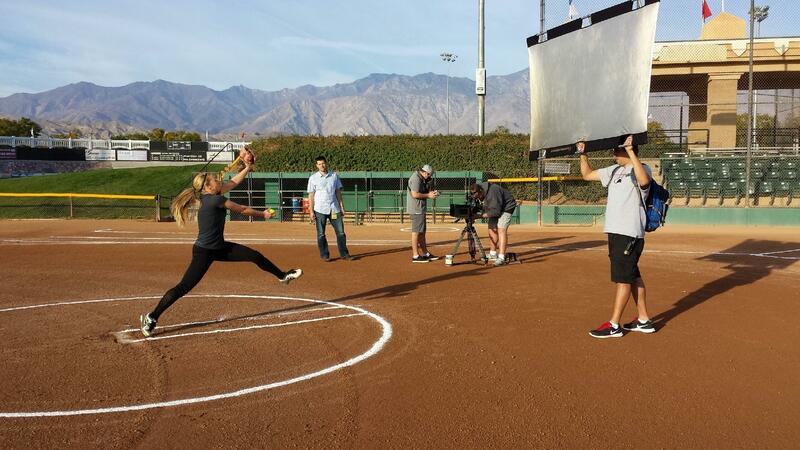 She is someone who doesn’t really throw above 60mph, but her spin is amazing. 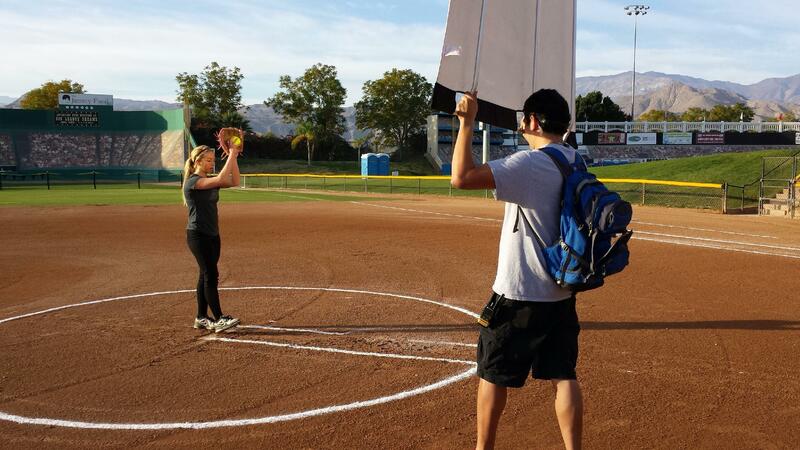 She is a true pitcher. She is not going to blow the ball by you, she is going to be crafty in her locations and precise in her spots by mixing up her pitches in different quadrants. I highly recommend being able to go and watch this senior pitch in real life or on TV to see a real pitcher and not just a thrower. 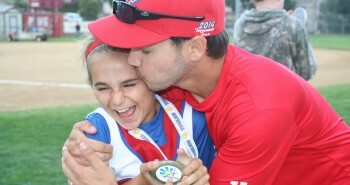 She is living proof that you do NOT have to throw hard to have success at the collegiate level. (If you remember, she helped pitch Tennessee to the National Championship game last year in Oklahoma City to go up against Oklahoma). 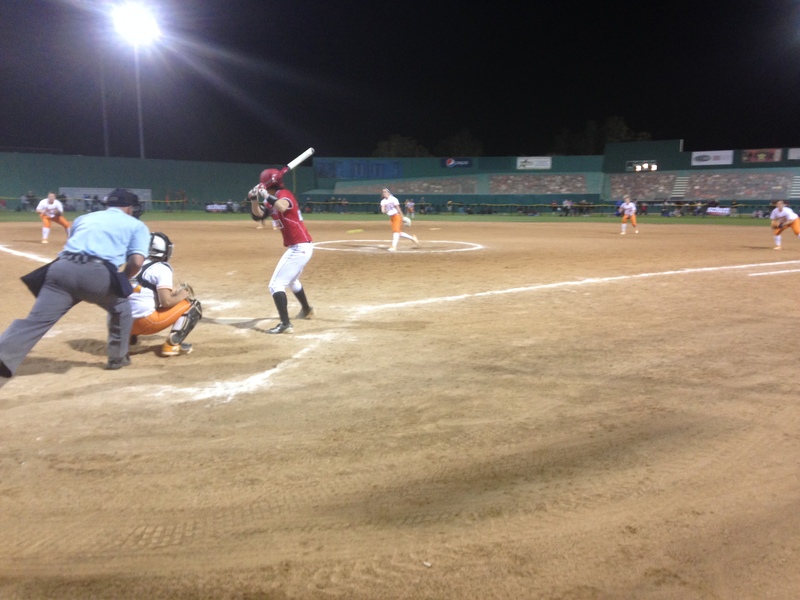 Offensively, I enjoyed watching Stanford third baseman Hanna Winter. She plays third base and she hits left handed. 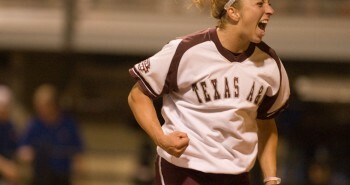 If you want to see someone who might be one of the quickest, most athletic players in the country, she’s your girl. I saw her make some amazing plays at 3B, and the way she runs bases and has such great bat control front the left handed side of the plate is just awesome. Tatum Edwards, senior All American pitcher for Nebraska, throwing against senior, All American short stop, Madison Shipman, on Fenway at Big League Dreams in Cathedral City. Great drop ball and change up that Edwards has and throws about 65mph. All American, senior pitcher, Ellen Renfroe led the way for Tennessee, So awesome to get to watch her pitch from back behind home plate. 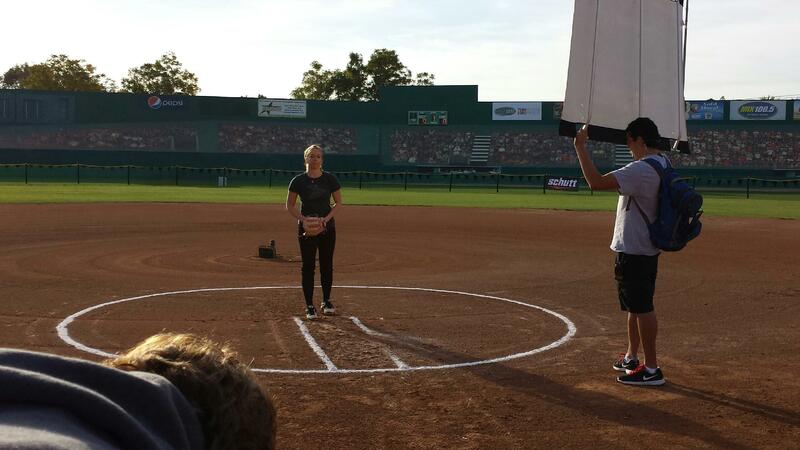 The first time I had seen her pitch live. Remember the National Championship Series last year when she went up against Oklahoma and threw an amazing game against them? 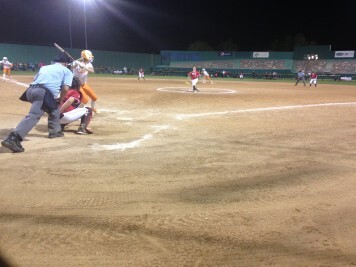 Some of the best movement and spin of any pitcher in the country. Always a packed Wrigley Field whenever UCLA takes on anybody at the Palm Springs Classic. Californians love to come out and see their Bruins play. Check out the background and getting to play in the mountains. 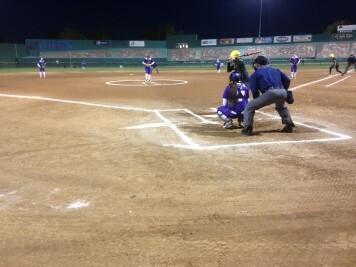 Senior pitcher for LSU, Ashley Czechner, going up against Oregon senior third baseman, Courtney Ceo on Fenway! 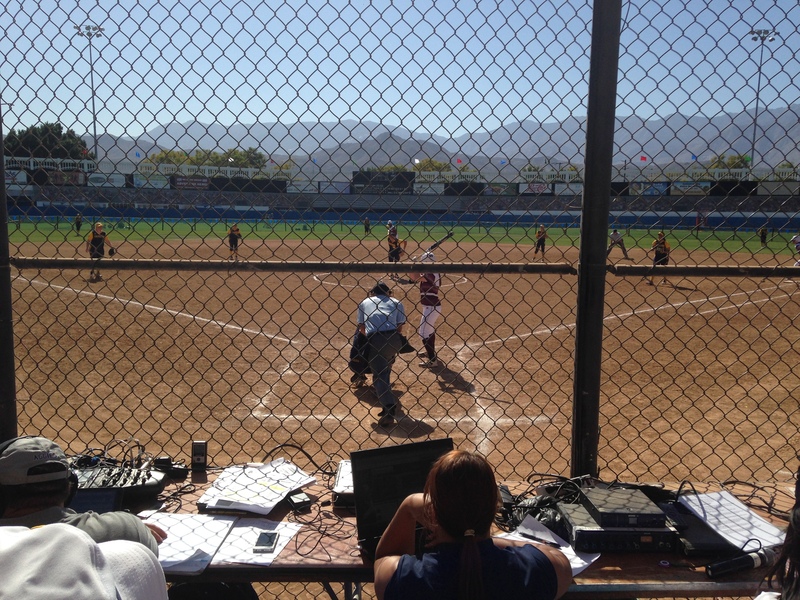 Texas A&M taking on Cal on Yankee. 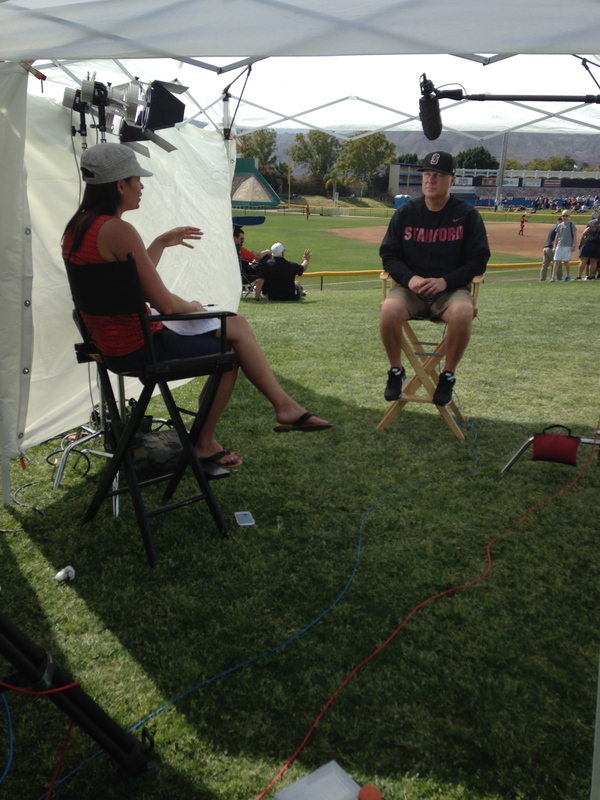 Throughout Friday and Saturday, teams were stopping by to take go through different stations, taking pictures, getting video footage and also interviewing with Holly Rowe and Jessica Mendoza. I tagged along for some! They interviewed over 12 teams this weekend, and next weekend they will go out to another big tournament in Orlando, to get some of the top teams there, too. I got to hear about so many different team’s cultures and head coaches talking about individual players who make a difference on their team. There were tons of good stories from the head coaches and the players, many of them you will be able to catch on ESPN’s coverage of the regular season and post season, which will start at the end of March. 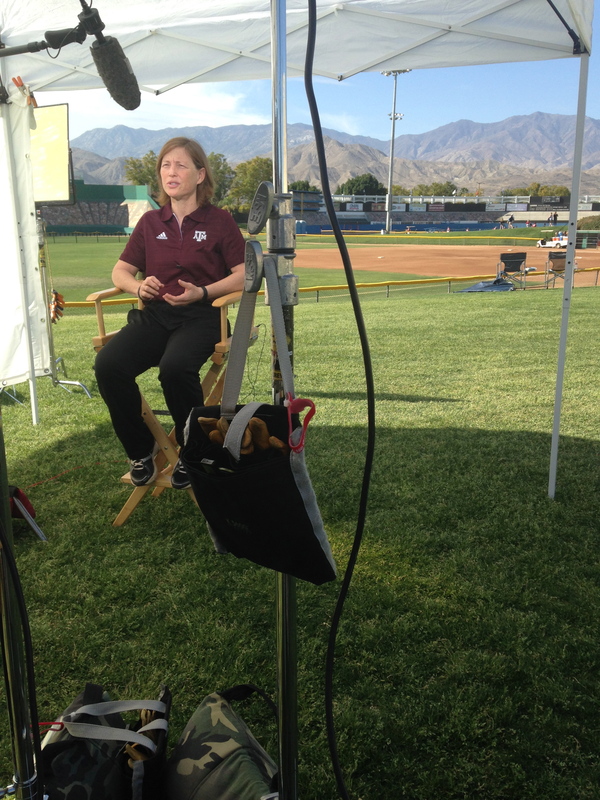 Head Coach of Texas A&M sitting down and talking to Holly Rowe about the 2014 Aggies, their experience in the SEC, approaching 1000 career wins, and previewing their televised match ups against Florida and Tennessee. 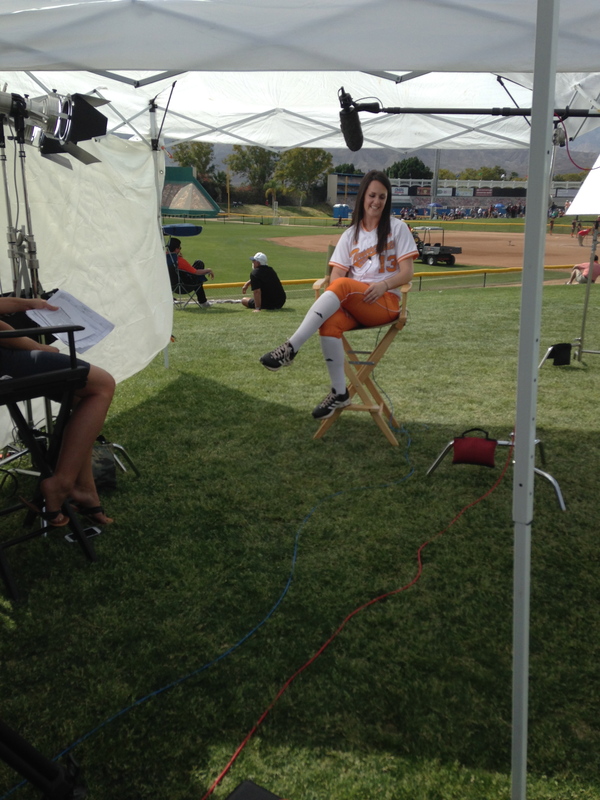 Senior pitcher for Tennessee talking to Jessica Mendoza about her senior year and last year’s WCWS National Runner Up season. 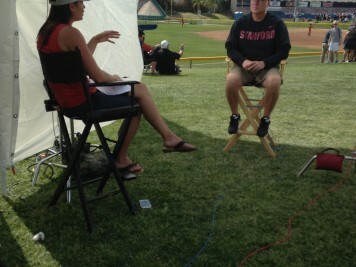 Stanford Head Coach, John Rittman, talks with Stanford alum, Jessica Mendoza. Cool moment to get to see them interact, as he used to coach her when she was a player in the PAC 10. 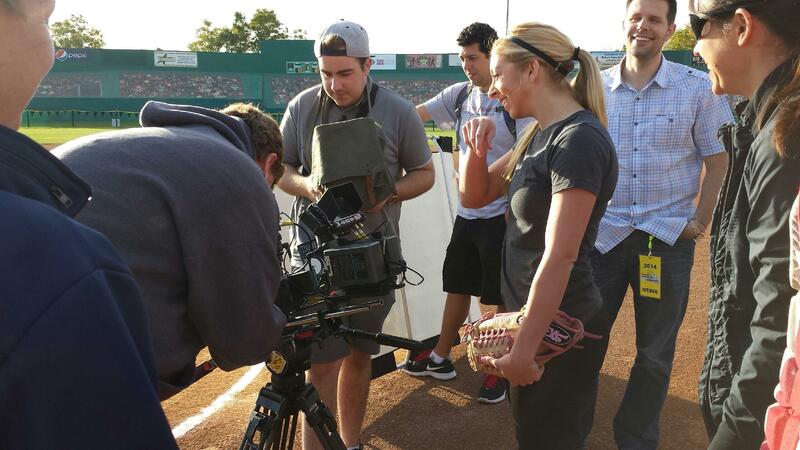 Saturday morning, the ESPN crew met up at the field to use an incredible camera that shoots at thousands of frames per second — 3200 frames per second to be exact. Kristyn Sandberg, who played at Georgia and currently plays for USSSA Pride, caught and hit, I pitched, and Jessica Mendoza also came to hit, too. This camera was so awesome – the detail it catches of every little thing is so amazing. They zoomed in on my release from a side angle, my drag from a side angle and then they filmed from back behind Kristen catching me to get the ball coming out of my hand, too. 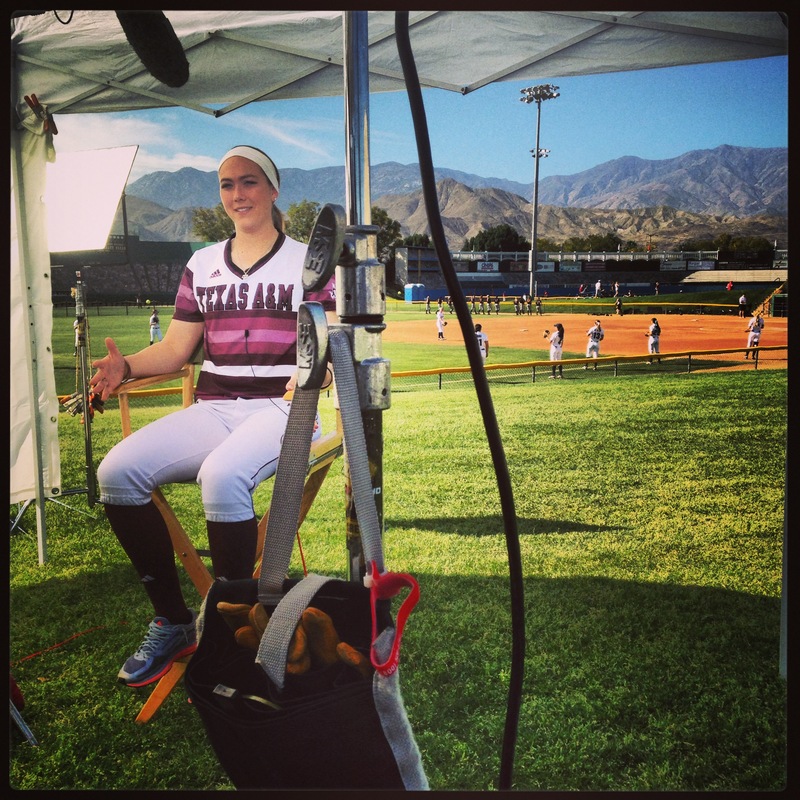 They also shot some catching, fielding and hitting clips all done by myself, Kristyn Sandberg and Jessica Mendoza. 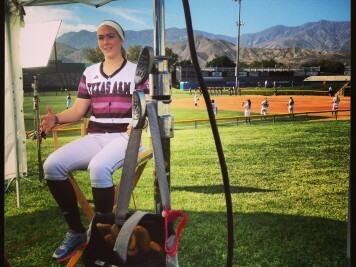 These will be used for different shots throughout the coverage of college softball. You most likely won’t be able to see or tell that they are me or Kristyn, because they were more about cool shots like the look of a ball coming out of a pitcher’s hand at release, the look of a pitcher’s feet dragging, the ball coming off the bat, a tag being made at 3B. WE will know that the shots were of us, but not very many people will probably be able to tell! Previous postSo, What Exactly Are College Coaches Looking For?